Caravan Guard look after motorhomes of all shapes and sizes, but our newest customer has a ‘van that’s a bit more colourful than most – the Reggae Reggae bus. With a bombastic soundsystem, lowered suspension and a paint job Levi Roots himself would be proud of, this isn’t a motorhome that blends into the background. 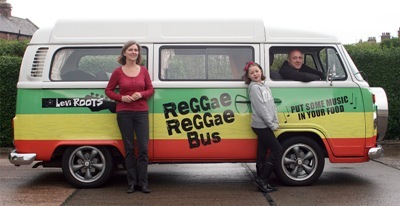 Lisa Hardy, pictured with husband Paul and daughter Emma, is the proud new owner of the red, yellow and green VW camper after entering a competition on the back of a Reggae Reggae Sauce label – and it was another Lisa, Lisa Cockroft, who was the insurance adviser at Caravan Guard who helped Mrs Hardy get all the cover she needed. Caravan Guard insure professionally converted motorhomes of all shapes and sizes providing the vehicle is no more than 21 years old. For more information, visit our campervan insurance page.